This guide will help you identify the conifers of the Pacific Northwest, native to the states of Oregon and Washington. It's easier to identify trees if we can focus on those native to a specific area. If we narrow the scope even more to just the conifers of northwest Oregon and western Washington, about 20 species are native to the area. Since different conifers live at different elevations, we can also use elevation to narrow the choice of conifers native to a given area. For example, only a few species grow at elevations below 2000 feet, and it is easy to identify each. This guide is organized to help you identify conifers by presenting them by area and elevation and showing photos and simple descriptions of identifying features for each conifer native to that zone. Common names: Like most plants, conifers have names that are determined by common usage. Sometimes a conifer will have several common names used in different regions. Common names can also be misleading. The Douglas Fir is not a true fir, and none of the native trees called cedar are true cedars. Scientific names: Each conifer species also has a scientific name. Why learn the scientific name? These names give you an unambiguous way to identify a species. These names are assigned and agreed to by botanists based on rigorous classification of each plant. Each species is assigned to a general grouping or genus and given a unique species name. The names are Latin or at least given a Latin ending. The name for a species written as Genus species, written in italics with the genus name capitalized. For example the scientific name of Grand Fir is Abies grandis. This name is universal throughout the world, no matter what language is spoken. As a practical matter, knowing the scientific name usually tells you something about the tree. For example, the name of Western Hemlock is Tsuga heterophylla. Tsuga is Japanese for hemlock. And heterophylla means variable leaves, which aptly describes Western Hemlock needles. Also, if you want to learn more about a tree, it helps to know the scientific name. Much of the scientific literature will refer to it by the scientific name. Familiarity with these names will prevent a lot of confusion and consternation. Of course, that's not to say that there's no confusion with scientific names. They may change. Science is not static. As botanists learn more about a tree, they may change its classification to a different genus. These changes generally generate a lot of discussion among the experts and confusion for the rest of us. Such a discussion has been raging about the classification of Alaska Cedar. It was in the genus Chamaecyparis. Recently someone proposed putting it in a new genus called Xanthocyparis. Others have countered, saying it should be classified as Callitropsis, Cupressus or Hesperocyparis. Botanists had a terrible time classifying Douglas Fir. Its name changed 21 times before they finally settled on Pseudotsuga menziesii. Text and photos in this guide are by Ken Denniston. I have enjoyed hiking the woods of the Northwest for over 50 years, and slowly become acquainted with the magnificent conifers of our region. My professional career involved technical writing for computer products, translating geeky technical jargon into documentation that ordinary people can understand. I have tried to do a similar thing in this guide, presenting information about conifers in a form that is easy to access and understand. For more information about conifers and the sources for the information in this guide, see More Info. If you have questions or comments, feel free to contact me. Start by looking at the Low-elevation Conifers. Once you are familiar with them, you can move on to conifers in other areas. A good place to start looking for low-elevation conifers is a nearby nature park where native conifers have been allowed to grow. For example, in Portland's Forest Park or the Tualatin Hills Nature Park in Beaverton, you can find all the inland low-elevation conifers of northwest Oregon and western Washington. Hoyt Arboretum in Portland is an excellent place to look for conifers. It has specimens of conifers from all over the world, including most of the species native to the Northwest. You can find the low-elevation conifers growing throughout the Coast Range and in the lower elevations of the Columbia Gorge and Cascade Mountains. 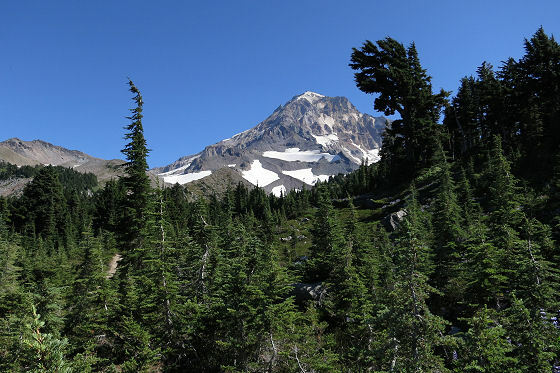 To find higher-elevation conifers growing in their native habitat, you will want to travel to the Cascades, although you can find some mid-level species growing in the Coast Range, for example, the higher elevations of Saddle Mountain near Seaside. Higher-elevation conifers also grow in the Olympic Mountains in Washington.